The most traditional of the traditional photographers on the Saint Lawrence River and Lake Ontario was William Notman and the photographers of the Notman Studios, based in Montreal, Toronto and range of other cities. Competing with the great metropolitan studios were a host of little studios around the lakes. 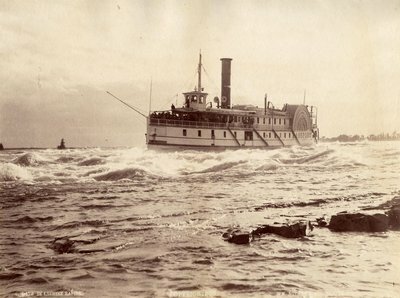 This photograph was created by Allan Fanjoy of Alliston, ON (a distinctly inland village) and celebrates the Kathleen, a small steam workhorse on the Bay of Quinte and Georgian Bay. Dating a photograph can be a real challenge. In this instance we know that Fanjoy operated in Alliston at least between 1890 and 1896. 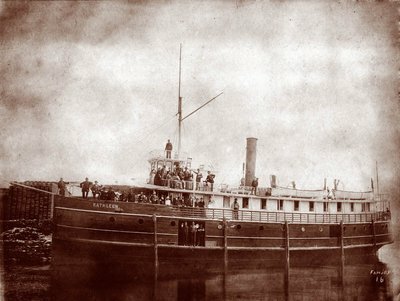 We also know that Kathleen was moved to Georgian Bay after she was sold to the North Shore Navigation Company in 1891 and that she was renamed City of London in 1893. On the other hands, sometimes it is nearly impossible to identify a picture. One of the tugs here is the Rescue. Unfortunately there were several tugs by that name on the lakes, both large and small. 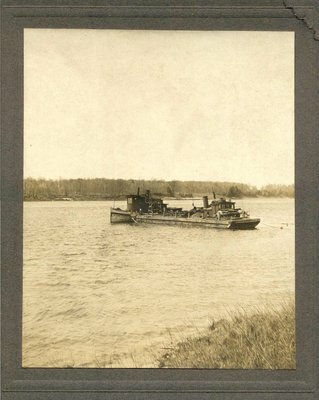 The detailed view of this shows a second tug and a barge, possibly with a road near the shore in the background. If you know more about this picture click on Details and fill in the Comments form. Still other photographs can be dated practically to the minute. 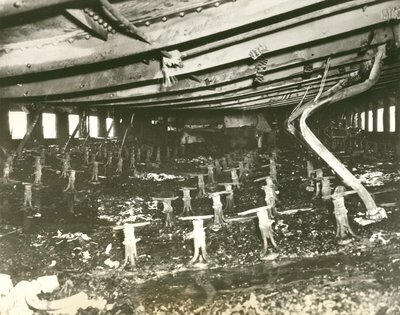 This one was filed as a news wire photograph on the morning of 17 Sept 1949 after the fatal fire on the Toronto waterfront. The accompanying text, claimed 250 lives were lost, when the number was in fact, less than half that.